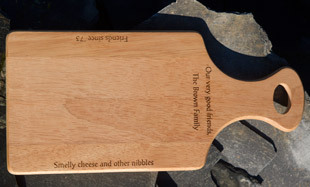 The Sign Maker for the very best in Bespoke Personalised Gifts : A lovely range of Engraved Bread Boards, Meat Board, Cheese Boards & Chopping Boards. 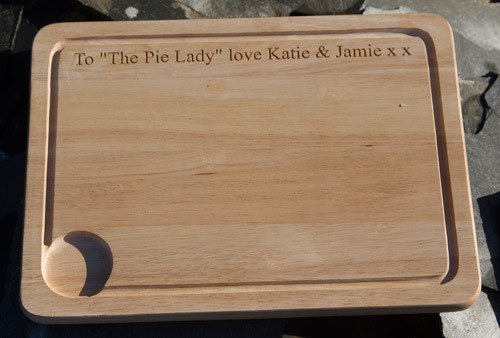 Personalised wooden chopping and cutting boards are ideal for as wedding gift or an anniversary or house warming present. The wood used for all the boards on this page is Rubber wood - Hevea brasiliensis It is a very stable hardwood from the maple family with a dense grain which does not tend to warp or crack. These are the trees which produce the latex for all the worlds rubber. Although this timber is exceptionally durable it still should not be put in a dishwasher! 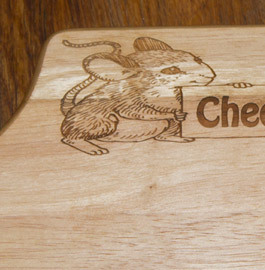 This is an easy clean wooden board designed for carving meat. It has channel all around to drain away fat with a collection well on one corner. 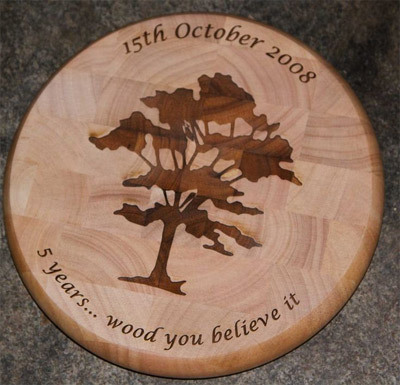 A round end grain chopping board which can be engraved with your message along with a huge choice of beautiful images if required. A quality product. 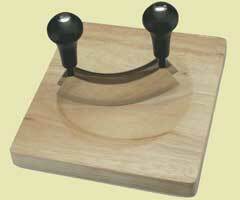 This circular wooden bread board is a lovely gift you know would be used every day. It can be personalised on the back or the front. A superb house warming present. 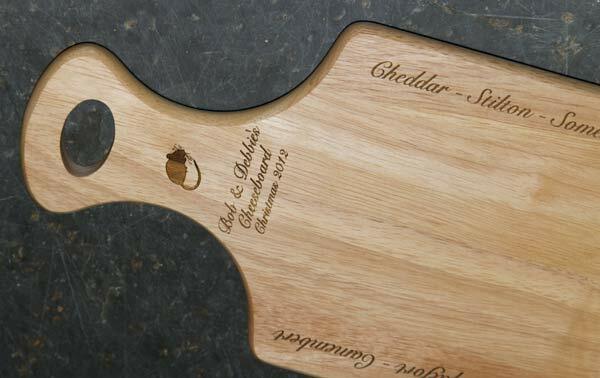 As with all wooden gift ideas on the page this personalised cheese board is made from heavea or rubber wood which is ideal for the kitchen. 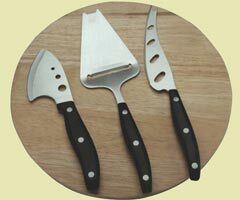 It comes with 3 knives making it a great value gift. A great value gift - ideal for new home present. Choose one of our many images to add a special touch along with your personal message. 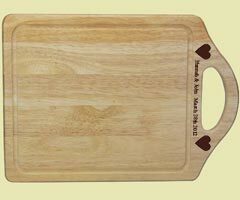 This board with a handle can be hung on the kitchen wall when not in use. 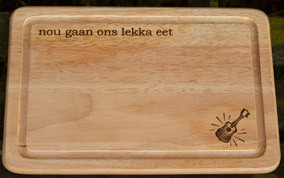 Your personal message can be on the handle or on the face of the board. 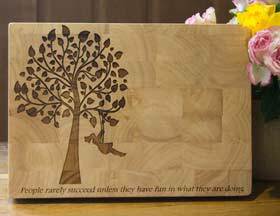 This is a really chunky butchers chopping block, which is made extra special with your personal message. 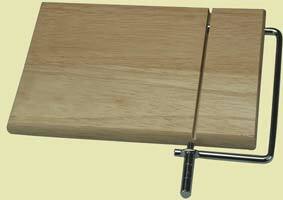 A simple cutting board which is exception value for money. Add your wording in any one of our many fonts. Another board which looks great hung on the wall. Why not fill the whole board with a large image & message below. If you would your gift to be personalised with an image, but without any words there is a £5 discount. To clean your board, simply rinse under hot tap and dry with paper toweling. Do not soak or put in a dishwasher. 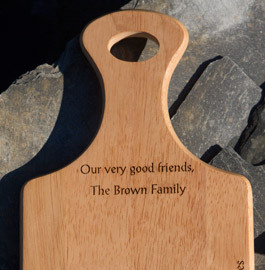 Our team at The Sign Maker looks forward to helping you with your Personalised Wooden Cutting Boards & Chopping Blocks.